At the end of a fairly typical day, I get a phone call from a photographer friend. In an almost shocked tone, he starts by asking me since when do I have images in the Reuters photo bank and, more importantly, why had I not mentioned anything to him. After joking around for a bit and making him believe that Â I’m actually a Reuters photographer for years, I decided to come clean and say that I’m really not working for Reuters nor do they have any images on mine in their collection – basically he did not believe me. After a couple more minutes in which I’ve actually managed to convince him that I have nothing to do with Reuters, he followed with a sombre “Then you better take a look at this” and sent me a link to the page which contains the image above. 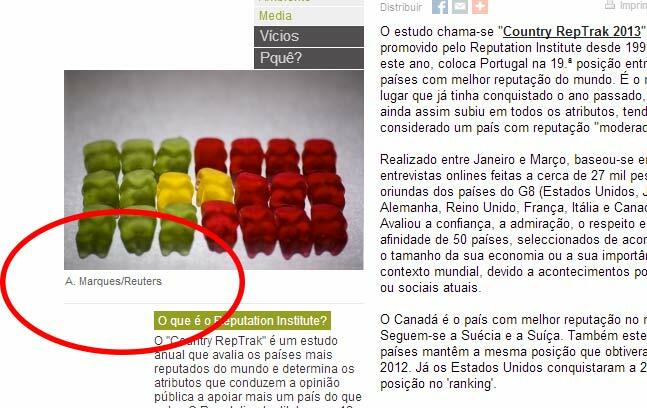 And there it was – my image, illustrating an article on the site of one of the most reputable newspapers in Portugal. Unlicensed. And look, they even gave me attribution, which is nice… /Reuters?!? So, somebody takes the time and effort to find the author of the image, “forgets” to even think about license, Â and then credits the completely wrong agency? Had to be the funny highlight of my day.